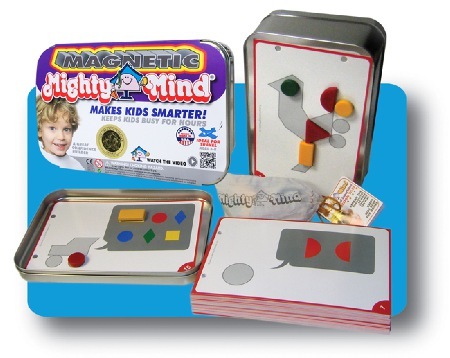 MightyMind, the award winning, highest rated 5-Star activity set is now magnetic. Contains 32 proportional design tiles in 6 basic geometric shapes, 4 colors, in large and small sizes, with matching magnetic shapes. The tiles are neatly stored in the convenient cotton storage pouch. Also included is a deck of 30 sturdy puzzle board cards which are organized and programmed in numerical sequence to show children how to build and solve puzzles.